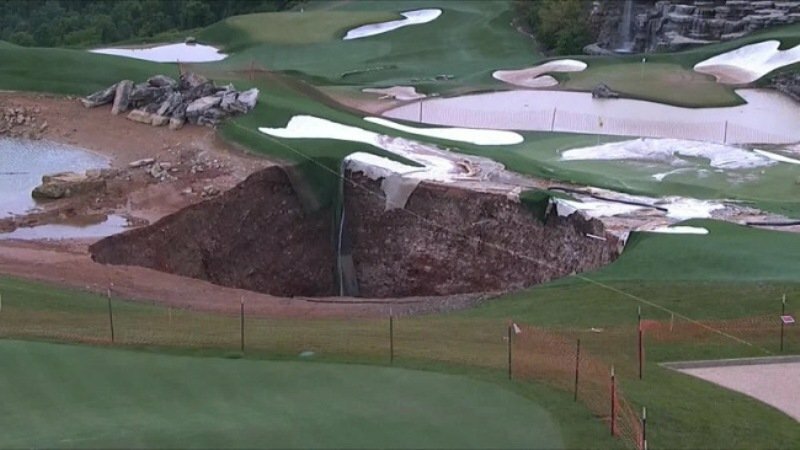 Few days ago, massive sinkhole opened up in the middle of the Rock Golf Course in the resort town of Branson in Missouri. The hole is 80 feet wide and 35 feet deep in some places and is formed by two different sinkholes near the entrance to Top of the golf course. The Jack Nicklaus-designed par-3 course is a part of the Bass Pro Shops-owned Big Cedar Lodge complex and hosted a Champions Tour event last month. Martin MacDonald, the conservation director for the Bass Pro Shops said that the hole is not near the main course and will not affect play. Engineers surveyed the Bass Pro Shops-owned course on Friday. Engineer Gary Pendergrass said that public and the facilities around were safe. He also said that next week, engineers will conduct a more in-depth investigation to determine the best way to replace the 7,000 cubic feet of material displaced by the hole. The next step he said is to drain a pond nearby to minimize the amount of water flowing into the sinkholes. According to the Missouri Department of Natural Resources, water is crucial in that runoff can make the sinkholes bigger. Geologists say that these sink holes are common in Ozarks because of the water constantly circulating through the bed rock below the ground. Because of this karst topography, there are many sinkholes and caves in that region. Pendergrass says that the biggest hole is “medium-sized,” but even so, the engineers will need to devise a plan to replace 7,000 cubic feet of dirt and grass, a process that could take up to two weeks. 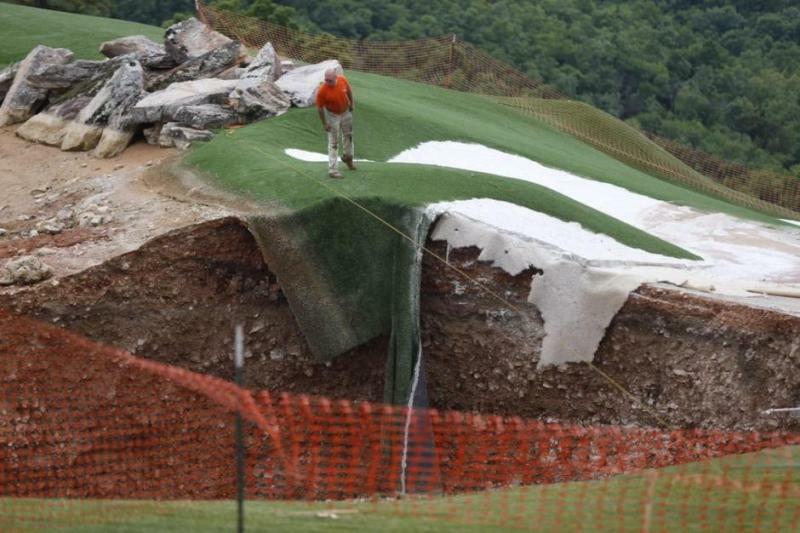 Luckily the sinkholes formed in the practice area of the course. But it is still possible that the sinkholes will grow or new sinkholes might form. Doug Gouzie, a professor at the Missouri State University has warned that heavy equipment moving around could increase the risk for more sinkholes to open. The Department of Natural Resources says that there are nearly 16,000 verified sinkholes in the state and that the record-holder is a sinkhole spanning 700 acres in northern Missouri. A sinkhole is the hole in the ground that is formed by the collapse of the surface layer. They are formed gradually or suddenly. Sinkholes are common where the rock below the land surface is limestone or other carbonate rock, salt beds or in other rocks, such as gypsum, that can be dissolved naturally by circulating ground water. They also occur in sandstone and quartzite terrains. A lack of water can contribute to sinkholes, too. In some underground cavities, water might be holding up a thin overhang of earth. If that water level falls, the overhang has no support and collapses. Sinkholes appear all over the United States. Florida, with its frequent rains and marshy terrain is usually id­entified with sinkholes, but they’re also prominent in Alabama, Kentucky, Missouri, Pennsylvania, Tennessee and Texas [source: USGS]. They generally develop in karst regions, a type of terrain known for soft bedrock [source: Southwest Florida Water Management District]. The U.S. Geological Service describes karsts as having many water elements, such as springs, underground streams, caves and, of course, sinkholes [source: USGS].